With these renovations come higher-income inhabitants. What about the low-income people already living in these communities? Often they are priced out and displaced, unable to afford higher rents and the cost of living in an area they have lived in most of their lives. Gentrification deeply affects those that are already living from paycheck to paycheck and those in precarious financial positions. And what happens to these people? Often, they are displaced to make way for those that can afford the rising prices. Many are left victim to housing insecurity and/or homelessness. This is one of the unfortunate by-products of gentrification that BLM Sacramento is working to highlight in local communities. We care about gentrification and its symptoms because it is often communities of color that experience this degree of displacement and racial and ethnic minorities, particularly African-Americans, are overrepresented among the American homeless population. While gentrification may seem advantageous, in reality, it amplifies homelessness and poverty. 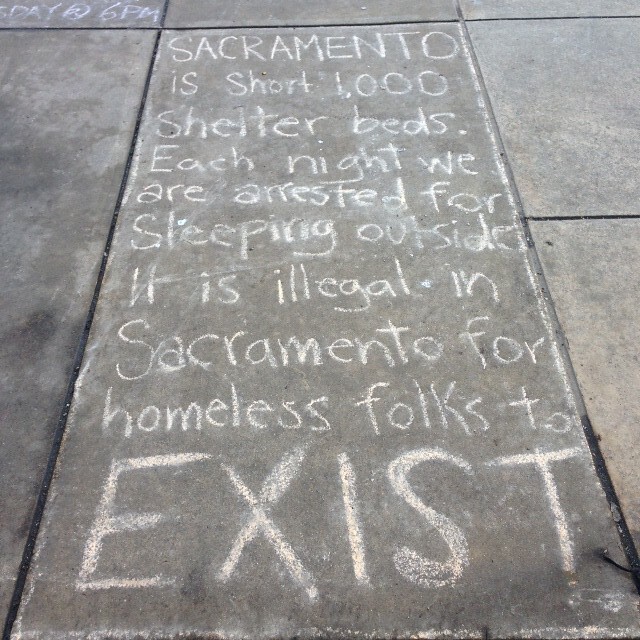 What about homelessness in Sacramento? A press conference was held yesterday and The Right to Rest Occupation announced their delegation to meet with the City of Sacramento subcommittee on homelessness. The delegation will work toward viable solutions including a repeal of the anti-camping ordinance. The Right to Rest Occupation has occupied city hall since December 8th and their battle has included numerous actions, including council meeting attendance, and a hunger strike. All of this is being done simply for the right to rest in public space. Black Lives Matter Sacramento stands with The Right to Rest Occupiers as they fight to repeal this oppressive camping ordinance. Join us tonight as we hold action tonight at Sacramento City Hall as we hold a die-in and protest followed by attending the City Council meeting for public comments. We stand with the Community Dinner Project in fighting a dangerous policy that not only criminalizes the homeless but endangers their very lives.